The Community Judge is the senior authority in the courtroom. He/she introduces the respondent to the teenage peer jurors who are informed of the charge against the respondent and the reported circumstances. 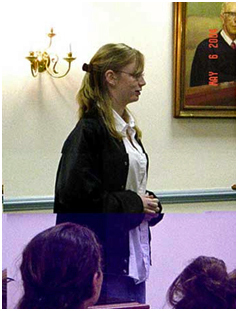 After hearing the evidence presented by a teenage prosecutor and defense attorney, the jury considers the appropriate sanctions for the offense. The decision is reviewed by the judge and read to the respondent by the Court Clerk or the judge. Based on experience, the judge discusses the offense with the respondent and parents/guardians present and the potential impact continuing such behavior can have on their future. All issues that may arise about court procedure, deliberation questions from the jury, or the applicable law are resolved by the judge. The prosecutor, representing the State of Maryland has the responsibility to seek justice and to seek a disposition (sentence) based on the severity of the offense committed, not simply be an advocate for the highest possible sentence. This teen reviews the details of the case, and prepares the case for presentation, gives an opening statement, questions the respondent for relevant facts, and gives a closing argument to the jury. The prosecution becomes familiar with both the aggravating and mitigating circumstances of the case and diligently brings forward all the reasons that the jury should impose sanctions that will be constructive and rehabilitative. The defense attorney represents the respondent and is their advocate. This teen reviews the details of the case in advance, and prepares the case for presentation to the jury, gives an opening statement, objects to any questioning by the prosecuting attorney that is believed wrong, questions the respondent, and presents a closing argument to the jury. Every effort is made by the defense attorney to bring out any and all mitigating circumstances to convince the jury to reduce the penalties they impose upon the respondent. While the defense attorney must zealously attempt to help the client, it is important to never misrepresent the case. The Teen Court Bailiff is an officer of the Court whose chief duty is maintaining the safety and security of all Teen Court participants. Duties of the bailiff are guarding the jurors, escorting the respondents and their families into the courtroom, announcing and assisting the Judge during the hearing, and maintaining order in the courtroom throughout the hearing. 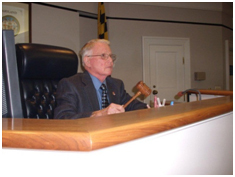 In Saint Mary's County Teen Court, the bailiff is oftentimes a Sheriff's Cadet or the adult staff volunteer who also serves as the jury monitor during jury deliberations. The court clerk is responsible for recording the business of the court proceedings. At the Judge's request, the clerk calls the cases before the Court by reading the case number and respondent name and announcing the charge. The clerk also records the time the hearing begins and ends on the court docket. When the jury returns from deliberation and the Judge instructs him or her to do so, the clerk stands and reads the verdict, and then records the sanctions on the court docket. Teen Court Jury duty is a privilege and serious responsibility. A juror is required to base the disposition (sentence) only on the evidence as heard in the court. The disposition should be designed to hold the respondent responsible for their actions. A juror must be able to perform honestly, without fear or favor. Jurors are randomly selected from the Teen Court volunteer pool and jury members often include previous offenders who have been sanctioned to serve jury duty. Jurors are screened prior to each hearing to ensure that they do not know the offender and are obligated to treat each case individually, perform honestly, conscientiously, without prejudice, and without fear or favor. 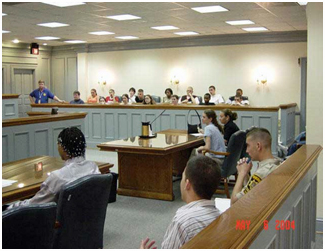 Jurors are required to base their decisions only on the evidence presented in court and upon the law as the Judge instructs. They also must reach a majority decision on the sanctions they will impose upon the offender. Prior to jury deliberations in each case, the judge will select a jury member to serve as the jury foreperson. The foreperson is responsible for guiding the jury deliberations, whether in the petit or grand jury format, recording the sanctions agreed upon on the case disposition form, and providing the same to the judge when asked after returning to the courtroom at the conclusion of deliberations.